NEW YORK, LONDON and ZURICH -- Four major banks agreed to plead guilty Wednesday to trying to manipulate foreign exchange rates and six were fined nearly $6 billion in yet another settlement in a global probe into the $5-trillion-a-day market. 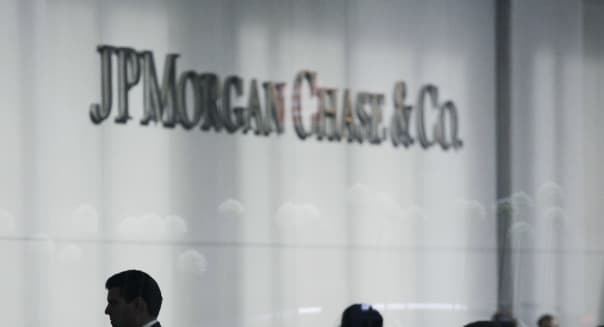 Authorities in the United States and Britain accused traders at Citigroup (C), JPMorgan (JPM), Barclays, UBS (UBS) and Royal Bank of Scotland (RBS) of brazenly cheating their clients to boost their own profits using invitation-only chatrooms and coded language to coordinate their trades. %VIRTUAL-pullquote-The penalty all these banks will now pay is fitting considering the long-running and egregious nature of their anticompetitive conduct.%The misconduct occurred up until 2013, after regulators had started punishing banks for rigging the London interbank offered rate, an interest rate benchmark, and banks had pledged to overhaul their corporate culture and bolster compliance. In total, authorities in the United States and Europe have fined seven banks over $10 billion for failing to stop their dealers from trying to manipulate foreign exchange rates -- used every day by millions of people from trillion dollar investment houses to tourists buying foreign currencies for their holidays. Wednesday's settlement stands out because Citigroup, JPMorgan, Barclays and Royal Bank of Scotland pleaded guilty and for the size of the penalties, including a $2.5 billion fine by the Department of Justice, the largest set of antitrust fines ever obtained in its history. "The penalty all these banks will now pay is fitting considering the long-running and egregious nature of their anticompetitive conduct," said Attorney General Loretta Lynch at a news conference in Washington. Lawyers said the guilty pleas would make it much easier for pension funds and investment managers who have regular currency dealings with banks to sue the banks for losses on those trades. "There is already a lot of work going on behind the scenes assessing how claims could be brought forward and those potential claimants will be looking to today's announcement for evidence to support their analysis," said Simon Hart, banking litigation partner at London law firm RPC. Britain's Barclays was fined a record $2.4 billion Wednesday, underscoring how widespread the misconduct was. Barclays staff continued to engage in misleading sales practices despite Chief Executive Officer Antony Jenkins' pledge to overhaul the bank's high-risk, high-reward culture. Barclays' sales staff would offer clients a different price to the one offered by the bank's traders, known as a "mark-up" to boost profits. Generating mark-ups was a high priority for sales managers with one employee noting, "If you ain't cheating, you ain't trying." Barclays fired four traders in the last month as a result of the investigation and New York's Superintendent of Financial Services ordered it to fire a further four who had been suspended or placed on paid leave. Benjamin Lawsky also warned that he was still probing the bank's use of electronic systems for foreign exchange trading, which make up the vast majority of transactions in the market. "Put simply, Barclays employees helped rig the foreign exchange market. They engaged in a brazen 'heads I win, tails you lose' scheme to rip off their clients," Benjamin Lawsky said in a statement. "While today's action concerns misconduct in spot trading, there is additional work ahead." Barclays had set aside $3.2 billion to cover any forex-related settlement and shares in the bank rose more than three percent to an 18-month high as investors welcomed the removal of uncertainty over the forex scandal. RBS shares rose nearly 2 percent. In New York, shares in JPMorgan and Citigroup were down 0.7 percent and 0.8 percent respectively. Swiss bank UBS, which avoided a guilty plea over the forex debacle, pleaded guilty instead to one count of wire fraud and will pay a $203 million fine for its role in rigging Libor after its involvement in the forex scandal breached an earlier Justice Department agreement. Switzerland's largest bank also had to pay $342 million to the Federal Reserve over attempted manipulation of forex rates. The U.S. central bank fined six banks for unsafe and unsound practices in the foreign exchange markets, including a $205 million fine for Bank of America (BAC), which, like UBS, avoided a guilty plea. UBS's penalty was lower than expected and this contributed to a more than three percent rise in UBS shares to their highest level in six and a half years. The global investigation into manipulation of foreign exchange rates has put the largely unregulated forex market on a tighter leash and accelerated a push to automate trading. Authorities in South Africa announced this week they were opening their own probe. -With additional reporting by Lindsay Dunsmuir in Washington; Joshua Franklin and Oliver Hirt in Zurich; and Steve Slater in London. Writing by Carmel Crimmins.